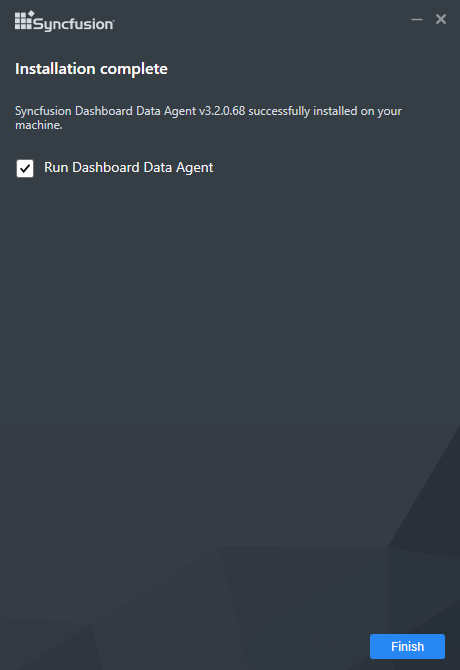 To import data from Salesforce Objects, RESTful Web Services, Microsoft Azure Table Storage, Microsoft Excel, CSV, Text Document, JSON, SQLite, Microsoft Access you need to install Syncfusion Dashboard Data Agent in the data server. This agent extracts the web accessible data to the data server and refresh the data to keep it alive based on provided time schedules. Run the installer either through clicking the Run button or by double-clicking the executable file from the saved location. The installer extracts the files and launch the installation wizard. Read and accept the license terms and conditions through checking the option I agree to the License Terms and Conditions and click Next. 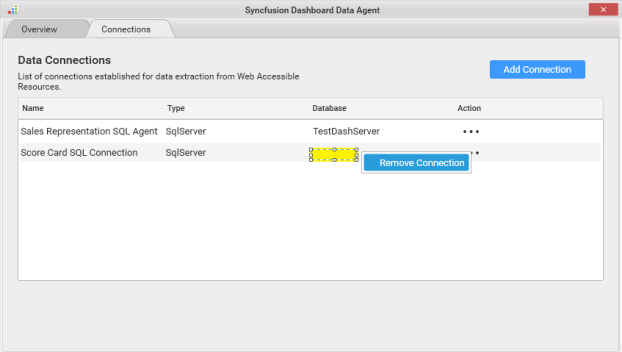 Browse to the location where you would like to install the Syncfusion Dashboard Data Agent and click Next. Browse to the location where you want to install the Dashboard Designer application, and then click Next. 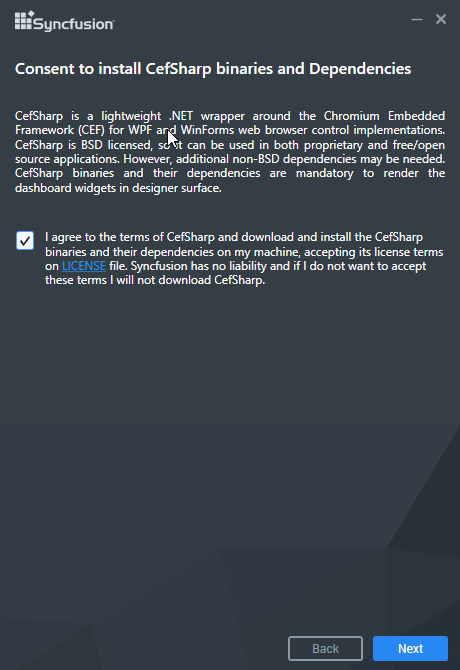 Read and accept the Consent the install CefSharp binaries and Dependencies and click NEXT. cefSharp is a lightweight .NET wrapper around the Chromium Embedded Framework (CEF) used for WPF and WinForms web browser control implementations. CefSharp is BSD licensed, so it can be used in both proprietary and free/open source applications. However, additional non-BSD dependencies may be needed. CefSharp binaries and their dependencies are mandatory to render dashboard widgets in the designer surface. 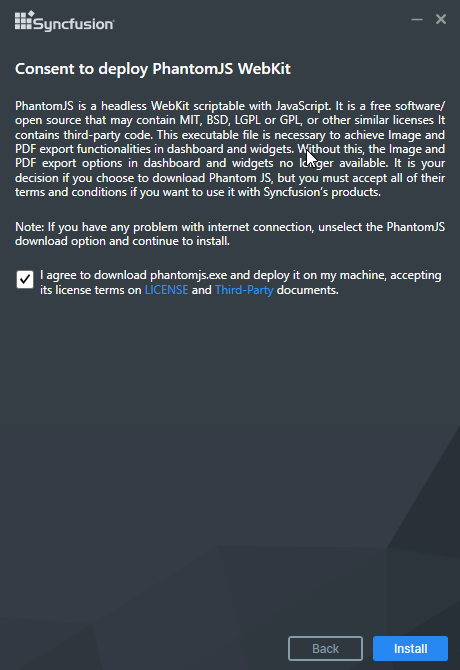 Read and accept the Consent to deploy PhantomJS Webkit and click Install. Now the installation begins. You can cancel the installation anytime through pressing Cancel, if needed. On successful installation, the above screen appears. 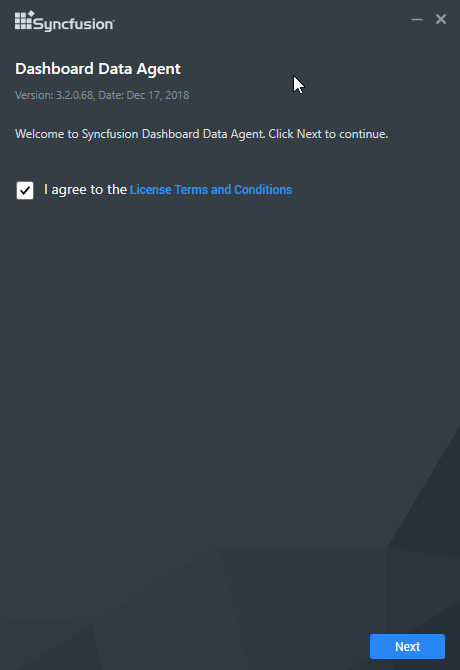 Click Finish to close the installation wizard and run the newly installed Syncfusion Dashboard Data Agent. You can also run the application later by unchecking the option Run Data Agent. Syncfusion Dashboard Data Agent is a self-hosting service which is prepared to be installed only in data servers. It is responsible for extracting data from Salesforce objects, RESTful web services, Azure Table Storage, Excel, CSV, Text and full data update for web accessible resources on the time based on schedulers. We can start the Dashboard Data Agent Service on a specific port by click on Start Service button. 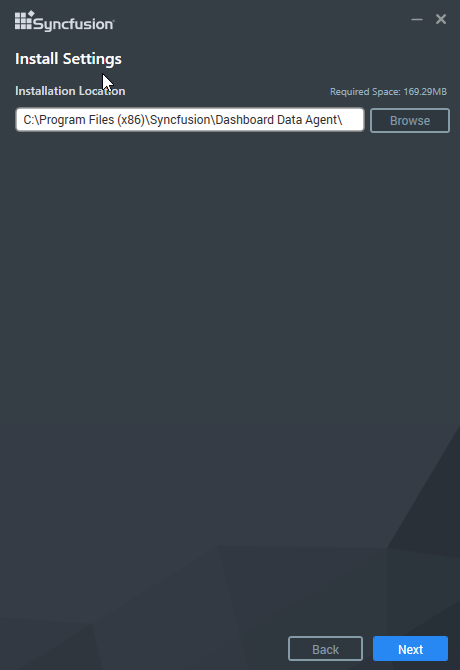 Once you clicking on start service button the Syncfusion Dashboard Data Agent start the service on the specified port which was mentioned in Agent Configuration Section. We can stop the Dashboard Data Agent Service on a specific port by click on Stop Service button at any time. 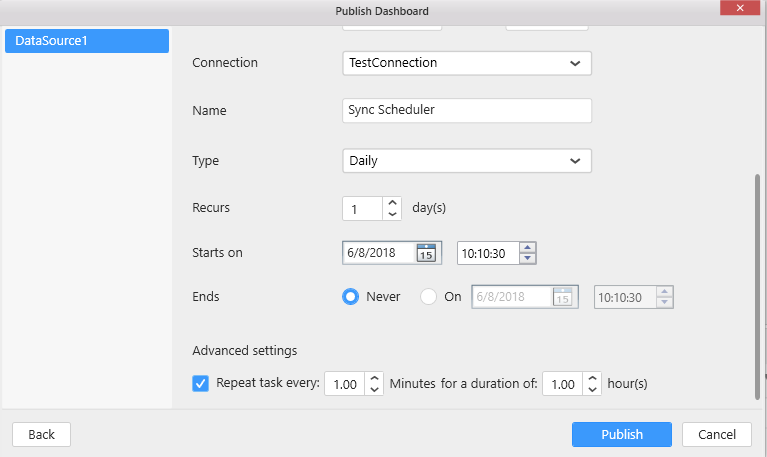 View Schedules lists the scheduled dashboard report in Scheduler Window.You can remove the particular schedule from the list by clicking Remove Connection option in Action menu of the scheduler list. Here the Refresh Access Token button enabled only when OAuth access token get expired. 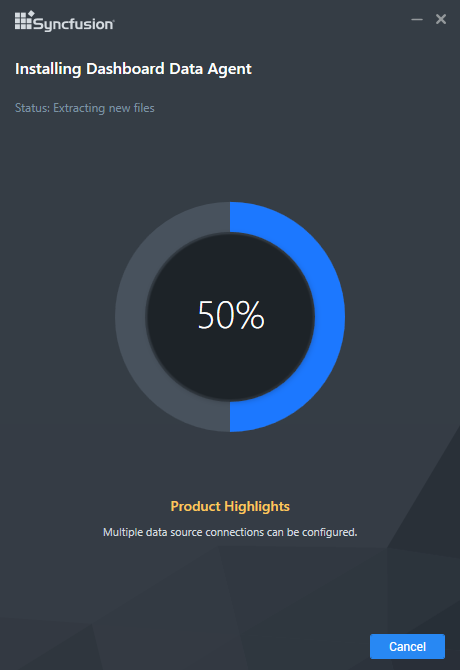 We can add the Target Connection details (where the published data should be extracted) by clicking Add Connection button. 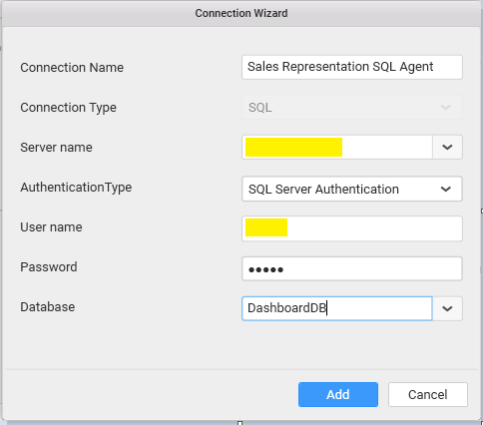 By Clicking Add Connection button the connection wizard open and fill the connection details in the required area to save the connection in Agent. Once the connection was added in agent you can publish/extract the data on specific connection by using its connection name. View All allows us to navigate to the connection tab. 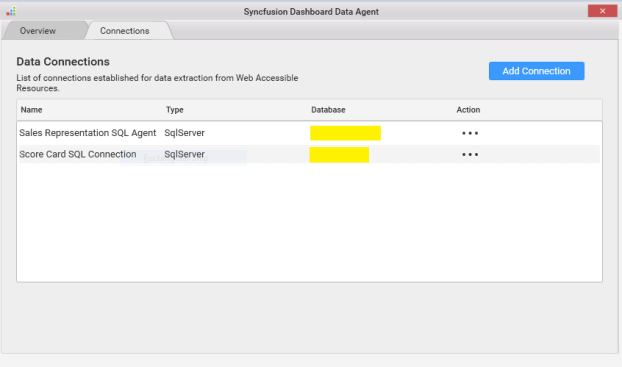 Agent IP text box shows you the IP of the machine where the Syncfusion Dashboard Data Agent was installed. Port text box allows us to specify the port where the Dashboard Agent service need to be run. Add in Firewall check box allows us to add a new inbound rule for the mentioned port in firewall. If you want to access the Agent which runs on a specific port from the client machine then you need to add inbound rule for the specific port in firewall. 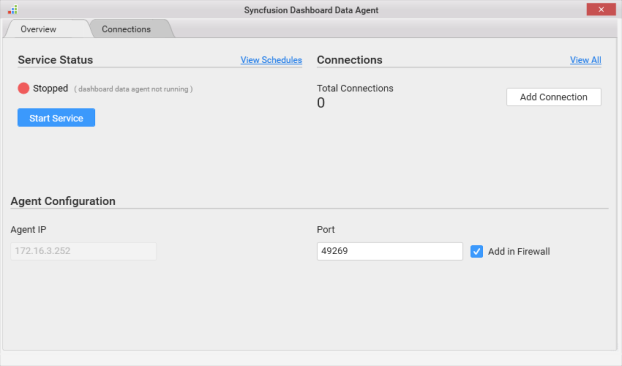 The Connections tab of the Syncfusion Dashboard Data Agent allows us to handle connections configuration in agent. The Add Connection button in Connections tab is same as the Add Connection button in Overview tab which is used to add and configure connections in agent. Connection modification in agent is irrelevant to the Service state i.e. you can add/remove connection at any time, even when the service is in stop state. 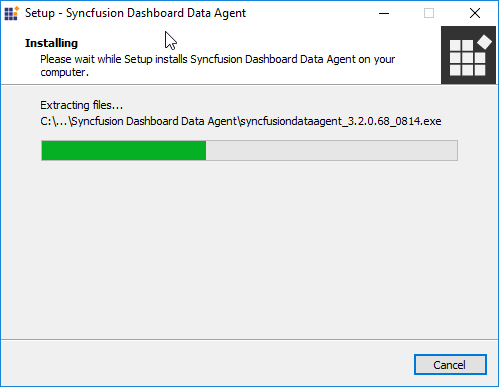 After Configuring the Syncfusion Dashboard Data Agent in data server we can publish the reports which was created using Salesforce Objects, RESTful Web Services, Microsoft Azure Table Storage, Microsoft Excel, CSV, Text Document, JSON, SQLite, and Microsoft Access in the data server by following way. Once you have completed the dashboard click on Server from menu and Publish and then Dashboard. Here the File Storage and File URL options are available only for Microsoft Excel, CSV, Text Document, JSON, SQLite and Microsoft Access data sources. 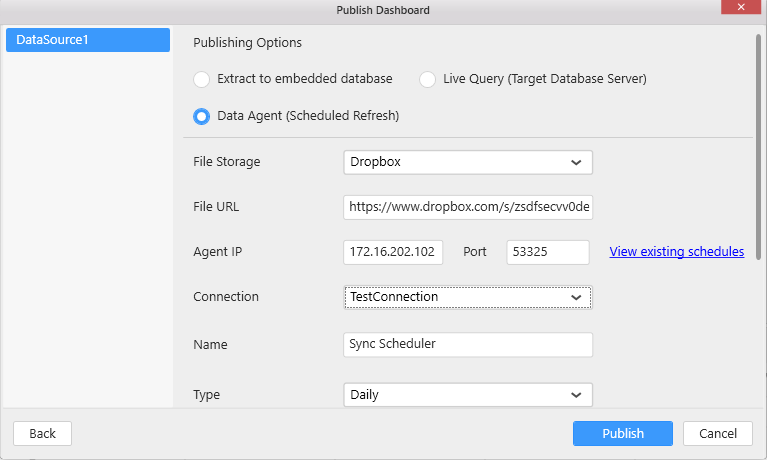 If you need to configure the schedule refresh for these type of data sources, you must upload the file into Google Drive or Dropbox or Dashboard Server cloud service. Click on Publish button once you have configured the scheduler.